My inner child loves surprises, and to discover a freshly cut sweetheart rose from the horn of Africa nestled on one's pillow is a touch that transcends time and space. This was the first surprise the Sheraton Addis reserved for our group, and much more awaited us the next morning as we explored the halls, nooks and crannies of this elegant hotel and its spacious, luxuriant, terraced grounds. Later, we discovered ornate vases of Ethiopian roses literally everywhere; in the restaurants, around the lobby and corridors, at the pool-side, and at a festive wedding we attended on our first evening there. Freshly cut roses perfumed the air at other locations throughout the city. After asking around, we discovered that these fragrant blooms were home grown &emdash; a budding new industry that's capturing hearts and markets in Europe and the USA. Since Addis Ababa means "new flower " in Amharic it is significant that this 8-year old cut flower business is flourishing nearby. Water for continuous irrigation of the flower beds is pumped and gravity-fed from Lake Zama. Already exporting over 100,000 roses weekly and employing over 200 workers, Meskel Flowers, is expected to more than double in the next few years. The other side of the equation came that same night on the Sheraton's broad balcony, as we watched the "dancing waters" pulsate to a classic symphony. It was the discovery that Ethiopia has become a wine producing center. Prior to dinner we were treated to a domestic dry red wine produced by the Gouder company. Our host was quick with a local quip -- "Champagne is good, but Gouder is gooder." Ethiopian vintners also make a palate pleasing dry white wine. When asked about our stay in Addis Ababa during February and again in May of 2000, I state emphatically that the whole time was one extended celebration. Few times in my life have I felt so much at home, laid back and yet so very special. The hospitality began with the staff at the pleasant hotels we stayed at, and extended to so many of the people we met, from local tour operators to embassy staff, merchants, tour guides, doormen, you name it. 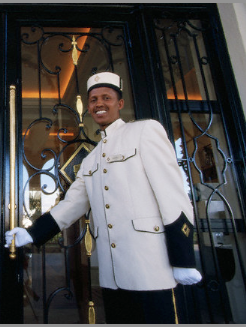 As one of Sheraton's "Luxury Collection" hotels, the Sheraton Addis combines Ethiopia's richest cultural elements and traditions with international and neoclassical architecture. Aware of Addis Ababa's position as one of the world's great crossroads of the aviation age, Sheraton offers upscale banquet and conference facilities for up to 1,500. The hotel's state-of-the-art Business Center provides secretarial and computer services, with e-mail and fax-printout. Location, Location, Location: The Sheraton Addis is conveniently close to the Capital's key attractions and historic sites, including Ethiopia's National Palace, the National Museum, St. George's Cathedral and the "Merkato," Africa's largest open air market. For relaxation in soothing waters, the famous Filwoha Springs thermal baths are nearby. The United Nations Center is just 5 km from the hotel, and it's a 7 km taxi ride to the International Airport. Sheraton Addis offers the largest and most prestigious banquet and conference facilities in Ethiopia, providing over 1,500 sq. meters of meeting space. The 9 main meeting rooms can be subdivided into 12 and includes the magnificent Lalibela Grand Ballroom with a capacity of up to 1500 guests. The hotel has 5 restaurants: an Italian, an Indian, a French Gourmet restaurant, a pool restaurant specializing in barbecue, and an all day dining room. PO Box 6002, Woreda 14, Kebele 24, Addis Ababa, Ethiopia . Photo of guard by Muguette Goufrani. Global hotel chains are poised to spend hundreds of millions of dollars in Africa over the next few years to meet increased demand from both international tourists and the continent's own fast-emerging middle class. Africa was the only region in the world to show growth in tourism in 2009, according to the World Tourism Organisation. In 2010 international arrivals rose by 6 percent to 49 million, slower than Asia or the Americas but double the growth rate for Europe. Industry executives say that as consumer spending stalls in developed markets, more multinationals are betting Africa's growth will eventually translate into meaningful revenue -- if they can negotiate the considerable regulatory and infrastructure challenges of doing business there. InterContinental Hotel Group, Accor, Starwood and Rezidor Hotel Group, the group that operates the Radisson Blu chain, are among those looking to capitalise on the continent's urbanisation and build up its underdeveloped hotel industry. "In the last 48 months we've added 33 hotels -- some already opened and others under development -- to the African continent," Andrew McLachlan, Rezidor's vice-president for business development Africa and Indian Ocean islands, told Reuters in an interview in Cape Town, one of the continent's tourism hot spots. "If we don't have any curve balls, we should open another eight hotels in 12 months across five countries," he said, adding that almost all of developments were being undertaken by local owners. Among the projects planned was a $40 million Radisson Blu upscale hotel in the Mozambican capital of Maputo and a 120-room 300 million rand lodge in South Africa's Kruger National Park, expected to open in 2013. "When looking for growth it's only natural to look at Africa, (which is) not as badly affected by a slowdown. There is potential for higher growth for hotels here than in traditional markets," said Martin Jansen van Vuuren, a director at consultancy Grant Thornton Strategic Solutions. Sub-Saharan Africa's economies are expected to grow at an average of 5.5 percent in 2011 and just under 6 percent in 2012, according to the IMF. While that's still short of China's blistering pace of expansion, it handily outpaces most of the developed world. The market for higher-end accommodation is woefully underserved on the continent. "We consider that there are a large number of capital cities in this continent where we either have no representation or insufficient, and if you ask me what my objective is for the next five years, it is to begin to redress that imbalance," said Michael Cooper, InterContinental's vice-president development for sub-Saharan Africa. Encouraged by the economic and political outlook, InterContinental is looking for opportunities in Cape Town, Dar Es Salaam and Addis Ababa as well as Africa's west coast, Cooper said. IHG is currently building three new luxury InterContinental hotels in Kampala, Luanda and Lagos. But expansion in the world's poorest continent does not come easy. Many of the hotel developments come up against the ubiquitous challenges of infrastructure constraints, corruption and regulatory hurdles, which combine to cause higher costs and lengthy delays. In the Angolan capital of Luanda -- the world's most expensive city -- Rezidor is expecting to import everythingexcept cement for its flagship Radisson Blu, already delayed for 15 months after local authorities decided to build a road through the site after initial plans were agreed, McLachlan said. "Sometimes, even when you are a city centre hotel, you've got to design your hotel as if it was on an island with your own water purification, sewage plant, and even generate your own electricity."